We haven't made paella in ages, but when we saw that we still had some leftover seitan sausages that needed to be used and a fennel bulb in the fridge, it seemed like a great (if non-traditional) pairing. The fennel was braised -- cut into 12 pieces, placed in a single layer in a small pan with enough water to come half way up the sides of the fennel with 1 tbs. of earth balance, then brought to a boil with the lid partially covering the pan until the water evaporates, about 15-20 minutes. Add salt and pepper to taste, then set aside until added to the paella. 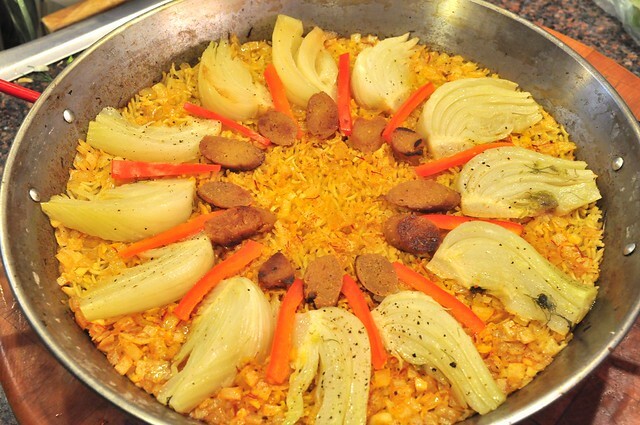 The sausages were sliced and fried in a little olive oil until browned, then set aside until added to the paella. 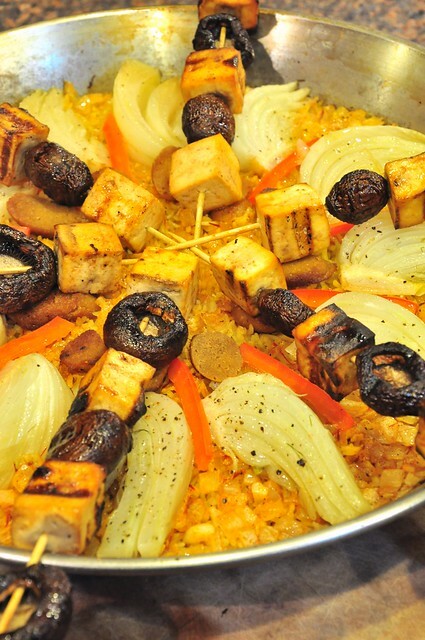 We use a paella pan -- but you can also make it in a wok, or a large saute pan. Over med-high heat add the oil to the pan and sweat the shallots for 2-3 minutes, then add the garlic and cook for 1 additional minute. Add salt and pepper to taste. Add the rice and stir to coat and cook for an additional 2 minutes. Add the smoked paprika. Add the saffron to the veg stock and allow it to rehydrate for 1 minute or so. Then pour the stock over the rice, scrape down the sides and bring to a boil. Add the lid and reduce heat to a simmer. Cook for 15 minutes. Remove lid, arrange the fennel, red bell pepper strips & sausages. Put the lid back on and cook for another 5 minutes. Check for seasoning and serve hot. 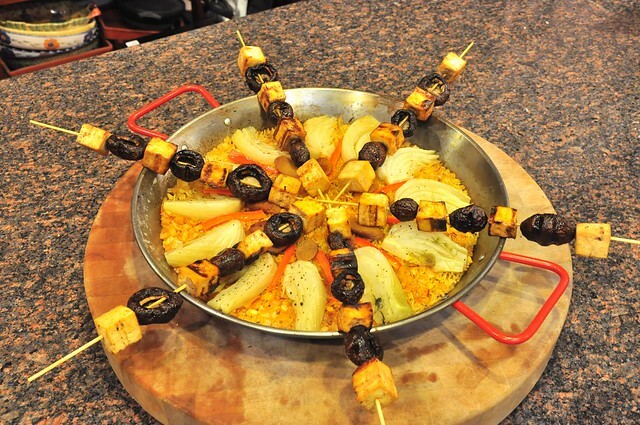 The shish kabob consisted of alder-smoked tofu cubes, alternating with button mushrooms marinated with a combo of tamari, olive oil, ketchup, agave and black pepper, then grilled while the paella cooked.